Diabetes is on a steep rise occupying the 8th slot among the most prevalent non communicable diseases globally, affecting 422 million persons of both genders. According to the World Health Organisation (WHO), high blood sugar levels killed nearly four million persons in 2012 globally, and are poised to escalate in the future. This is why the WHO theme for World Health Day this year had been to 'Prevent, Treat and Beat' diabetes which, WHO Representative in Sri Lanka, Dr Jacob Kumarasan, described as the 'Mother of all diseases' at a media seminar last week. Here Honorary Director National Diabetes Centre and Secretary Diabetes Association of Sri Lanka, Dr Mahen Wijesuriya, explains WHO's concerns, Sri Lanka's reality and the significance of lifestyle changes. Q: Diabetes was the focal subject of discussion on World Health Day observed early this week. Do you see a sharp increase in the disease compared to a few years ago? A: The prevalence rate is 10.3% for the over 20-year population, which is 2.1 million. In addition there are 2.3 million persons who have pre-diabetes. This makes a grand total of 4.4 million persons who have dysglycaemia (Diabetes + pre diabetes) in Sri Lanka. This figure shows 1 in 5 persons have abnormal blood sugar levels in the country, with the figures likely to go up in the near future. The sharp increase compared to a few years ago is occurring in the urban and rural areas and has now reached 16% urban and 8% rural. In the under 20-year category, in the urban sector, dysglycaemia is over 8.2% according to a research study in 2013 done by the Diabetes Association of Sri Lanka. A:Lifestyle changes, no proper nutrition, inadequate exercise, stress associated with urbanisation, high aspirations, and weight gain. Lifestyle change is the most direct cause for diabetes. Q:Has the average high risk groups age-wise for diabetes also changed compared to the past? A: What was once an over 40-year high risk now encompasses all ages, especially Type 2 Diabetes, which has cut across all age groups. Q: Early indications of diabetes? A: Fifty per cent of those with diabetes are unaware they have diabetes as they have no symptoms. Early indications include: weight loss, increased urination, increased thirst, delay in wound healing, altered vision, altered sensation in the feet, numbness, tingling and cramps... to mention a few important ones. When these are present, it should be followed up by blood sugar estimations: 100mg% before meals and less than 140 mg% 2 hours after a meal is the international standard we follow. Q:What is the most common diabetic type prevalent in Sri Lanka? A: 95% of diabetics have type 2 diabetes. Q:Which organs of the body are most affected by diabetes? A: Heart, brain, kidney, eyes and feet. Diabetes affects organs through a reduction in blood flow, which is often associated with abnormal fat deposition secondary to increase in cholesterol levels and hypertension. A new technology is available for the first time in Sri Lanka to help diabetic patients with foot problems, even while they are seated. Using a simple device, they can improve their circulation much faster, in a seated position. This device has been able to stop amputations, provide relief from venous insufficiencies, eliminate symptoms due to diabetic neuropathy, faster than conventional treatment methods, and increase blood flow in patients with PVD (healing diabetic ulcers) If they do these foot exercises with this device while seated, it's like climbing 2225 steps up a stairway and the blood circulation will flow so that patients will be able to feel the floor with their feet for the first time. Several studies in the US as well as our own feed back from our patients, prove this," he told the Sunday Observer. A: No. It can only can be controlled or managed through treatment and lifestyles. Hence it should be prevented from an early age. A: Adequate nutrition at all ages from gestation upwards to prevent under nutrition in the womb and over nutrition after birth is the key. Exercise a minimum of 30 min per day. Stress control, often ignored, is another essential component in preventing diabetes. 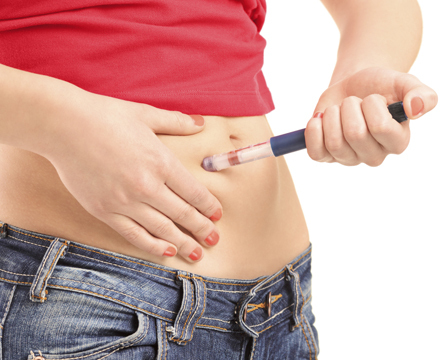 Q:Many pregnant women are reported as having diabetes or in a pre-diabetic condition? What is the cause? A: Same causes for Type 2 diabetes: Genetics, fetal origins, lifestyles and stress. All these factors pre dispose a woman to develop diabetes in pregnancy with an additional input of placenta hormones and their ill effects. Q: Several school going children have been reported as being pre-diabetics. Is this true? Q: How much sugar do you recommend in our daily diet? A: WHO recommends reducing 10% of total calorie intake. In Sri Lanka an average 9- 10 tsp of sugar is consumed per day. Recommendation is that you reduce this to 5 -6 tsp per day. 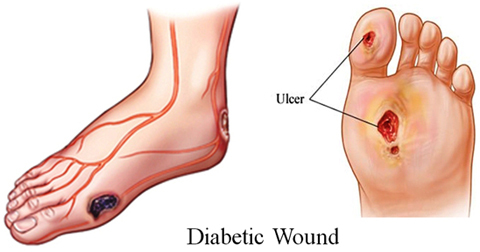 Diabetic ulcers: People with advanced diabetes have a diminished perception of pain in the extremities due to nerve damage, and therefore may not initially notice small scratches or bruises on their legs and feet. Diabetes also impairs the immune system and damages capillaries. Repeated injury, compounded by impaired healing, can cause even the smallest cut or bruise to become dangerously infected. Laser therapy - i.e. Light Amplification by Stimulated Emission of Radiation has been used to treat ulcers, pressure sores, infected wounds, burns, traumatic wounds and postoperative wounds that are failing to heal. It results in improved tissue repair, faster resolution of the inflammatory response, and reduction of pain. The Health Ministry has also initiated several programs to reduce diabetes. Speaking at the Health Education Bureau last week, Director Non Communicable Diseases Unit, Dr Thilak Siriwardene said 817 Healthy Life Styles Centres for normal persons to get free body checks have been set up islandwide. To find out their nearest healthy life styles centre they can telephone 2669599 from anywhere in the island. Director General Health Services Dr P.G. Mahipala said all in- house patients in state hospitals were now being served diabetic diets and circulars had been sent to all eating outlets to serve sugar in separate bowls. 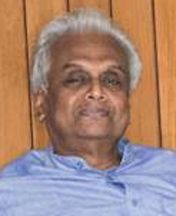 "We are also promoting the concept of eating more green vegetables and fruits and maintaining Body Mass Index at the correct level, Consultant Endocrinologist & Diabetetologist Dr Prasad Katulanda said, stressing that engaging in active physical exercise can prevent diabetes than rather than sitting in front of a computer. Q: What is the ideal diet for diabetics based on foods we grow locally? A: Quality quantity and timing are the mantra here for healthy living. Whole grain products such as 'mung', cowpea, gram, 'kadala' and minimally milled rice (red rice) high bran flour products - such as red rice, atta, kurkkan, uludu, ruling, soya with reduced sugars and refined starches such as white flour, bread and bread products. (High quality brown bread may be considered) and fats. Commercial products such as bread and buns should be avoided. Fruits and vegetables are highly recommended. Dairy products for a growing child should be full cream . For those over 20, fat content should be restricted. Fish and white meat (chicken) is preferred to red meat, which has excess fat. A: This is another important aspect often ignored when consuming meals. Spread regular meals throughout the day in equitable portions without delay as the latter leads to excessive hunger leading to unbalanced consumption at different times of the day. No child should leave home without eating. A wholesome snack should be sent for mid day (10.30 -11 a.m.) from home; lunch and dinner should be followed. Meal pattern for a school going child should be four small meals given at 7a.m , 11a.m, 3p/m and 7 p/m. ideally, with food prepared at home.